A Mastodon Unearthed – Hoxsie! In 1866, the Harmony Company of Cohoes set about building its Mill No. 3, a new cotton factory on the east side of Mohawk Street across from their first building. While the foundation was being excavated, the skeleton of a mastodon was discovered, “an event which awakened great interest here, and caused Cohoes to be for some time quite prominently before the public,” as Arthur Masten put it in his 1877 The History of Cohoes, New York…. At the north end of the building it was found that the layer of rock was thin and rested upon a large bed of peat, with a view to the removal of this, a small section was excavated to a depth of about sixty feet, and in so doing numerous relics of earlier ages were exhumed. The first discoveries, made in the middle of September , were decayed stumps and limbs of trees which lay imbedded in the rich loam; a week later, near the bottom of the bed, the jaw-bone of the mastodon was unearthed. Assuredly there are more things in heaven and earth than are dreamed of in our philosophy! Those who, during the present generation, have trod the earth of Cohoes have never taken into their wildest imaginings the strange things that were concealed beneath the surface. But the late excavations made by the Harmony Co., have brought to light the fact that a huge mastodon once dwelt where our village now stands, in an age that has been followed by the mightiest convulsions and upheavals. Fifty feet below the surface the jaw of this monster has been found, and has created in our village such a sensation as few events ever excited … The jaw is somewhat decayed and flaky but the teeth are in excellent preservation; the length of each jaw bone is thirty-two inches; the breadth across the jaw at the broadest point twenty inches and the extreme depth about twelve inches. On one side is a single tooth four inches in length and two and a half in width, and on the other two teeth one of which is six and a half inches long, the other four, and each uniform in width and shape with its neighbor opposite. The holes or cavities for the dental nerves are from an inch to an inch and a half in diameter…. More was found over the weeks: the skull, tusk, leg-bones, ribs and “enough other bones of the animal to make the skeleton nearly complete were found, most of them in a pot-hole distant some sixty feet from the one in which the jaw bone was buried,” Masten wrote. The bones were kept for some time at the office of the Harmony Mills, where they were visited by hundreds of persons, among whom were Profs. [O.C.] Marsh of Yale college, [James] Hall of Albany and a number of other scientific men. They were also placed on exhibition in Troy, at the county fair and in Harmony Hall … Several offers were received by the Harmony Co. from public institutions for the purchase of the remains, and it was thought at one time that they would be sold and the proceeds given to the Union Sunday School. It was finally decided, however, to present them to the state. The legislature voted an appropriation of $2,000 for completing the search for the bones, and mounting the skeleton, and passed a joint resolution tendering thanks to Mr. Wild and the Harmony Co. for their generosity. In the following year the skeleton was placed in position in the State Cabinet of Natural History, at Albany. The Cohoes Mastodon was first displayed at the State Museum and Geological Hall in 1867. 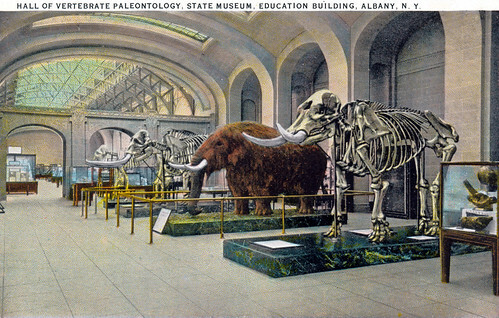 It moved with the museum to the State Education Building in 1915, but when the museum moved once again to the Cultural Education Center at the Empire State Plaza in 1976, the mastodon was removed from public view. It made a triumphant return to the entry hall of the “new” museum in 1998, but it was soon found conditions there weren’t optimal for 11,000-year-old bones, and it was put into a back hall of the museum where it is displayed today. There’s a great time-lapse video of the mastodon being assembled on the State Museum’s mastodon page.